I’m back after a lengthy silence to announce an exciting live appearance. I’ll be creating a live underwater soundtrack to a short watery film in Bangor this Friday, 7th March. Yes, you heard: underwater! 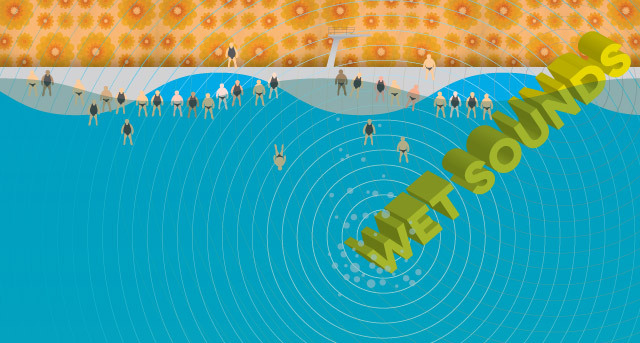 WET SOUNDS is one of those events that you hear about happening in other parts of the world that makes you think ‘I wish I lived there so I could go to that’. The good news, especially if you’re reading this from a location that’s, say, less than an hour’s drive from Bangor (the one in north Wales), is that you can go this, provided of course that you’re not reading this after it’s already happened. What is it? It’s an underwater alternative music performance in Bangor Swimming Pool. There are two separate sound spaces in the pool: one underwater, one above – you choose your own mix as you float on the surface or dive below. I’ll be there as part of an exciting new duo, I, Demons. I’ll be playing either above or below the water, and sound-fisherman Ed Wright will play either below or above accordingly. We will probably arm wrestle or play a word game to see who goes where. Following us will be hot Welsh surf troupe Y Niwl. There will also be other music, some aquatic dancing, lots of swimming, floating and diving. More details and ticket info at Bangor Sound City.